Discover the world-famous Planet Hollywood bar founded by famous Hollywood actors Sylvester Stallone, Bruce Willis, Arnold Schwarzenegger and Demi Moore. Planet Hollywood is an extraordinary place to dine where you have a taste of the Hollywood glamour for yourself. When you visit this Hollywood/American themed restaurant you will immediately feel the original Hollywood with an American diner with influences. You can try stereotypical American foods like burgers, hot dogs, and even a whopping mountain of ice cream to top it all off. The drink menu consists of many choices ranging anywhere between smoothies, milkshakes, beers, cocktails, sodas and so much more. A successful brand or more than 15 years, Planet Hollywood is a recently added name in London as of 2009. This restaurant chain was so popular in America that they decided to bring the mixture of Hollywood and American dining to Europe. Do you want your shining moment as well? Then Planet Hollywood is perfect to experience your very own little slice of Hollywood. Experience the big, bold, and beautiful interior. They have taken inspirations from older American diners and recreated it with just a touch of that Hollywood glamour we know so well. Have a seat on their chic red chairs and dine under just the right amount of light to set the mood. Here they offer a great experience located in the middle of London. This place is great for any occasion. Whether it’s a birthday, to say congratulations, or just for a new experience with a loved one, Planet Hollywood bar has it covered. 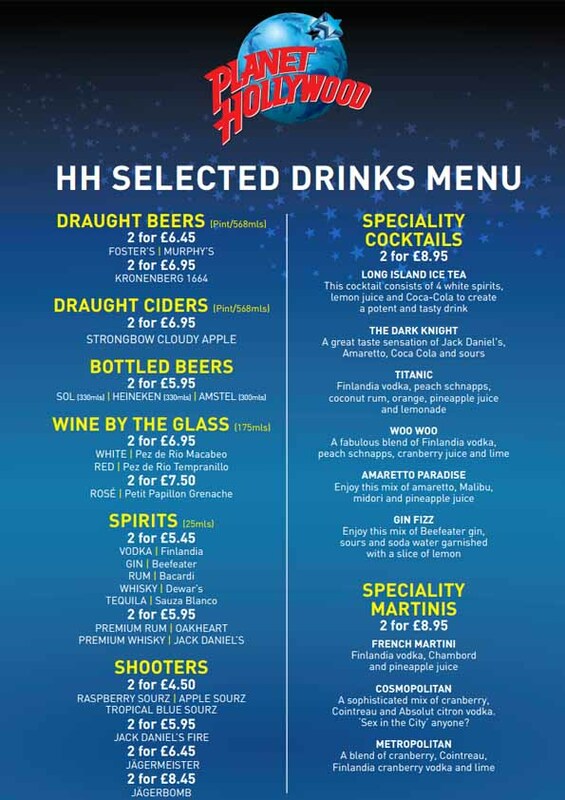 Planet Hollywood bar offers three rooms which all have a separate theme. Some fan favorites are the Cabana room and the James Bond room which makes this location perfect for any age. Planet Hollywood restaurant is located close by to London’s famous Piccadilly Circus. This location is easily accessible by public transportation by exiting on the Piccadilly Circus station. So buy a London Nightlife Ticket and make use of all the special offers! Profit from all the extra’s included in the London Nightlife Ticket!